B2B firms often fail to fully leverage digital touchpoints to provide their customers’ seamless experiences and generate insights that enable them to improve their operations or to facilitate an efficient management of supplier relationships. In the past, technology and B2B buying behaviour have hindered digital development. Despite recent progress, few B2B firms notice or harness the available solutions to create insights from data to simplify complexity of relationships. Digital customer portals are flexible tools, widely used in B2C, providing a flexible platform for a simpler and value-adding customer interface. B2B firms can use them to differentiate and provide additional services across the customer journey. Tailored customer experience is becoming the new normal in B2C industries, where experience is a core element of competitiveness. Over the past years, B2C companies have drastically improved their end-customer experience, notably with real-time data-driven interactions and by providing additional digital touch points like social media. On the other hand, B2B companies have yet to reach the same maturity, creating an opportunity for these firms to differentiate through customer experience. More and more B2B firms recognize this opportunity, seeing customer experience management is an increasing priority for them to improve their competitive position. To better understand this, we recently conducted a global survey, which was complemented with face-to-face C-level executive interviews. We found that B2B companies, while recognizing a need to change, are not yet fully leveraging available digital tools to enrich the customer journey and facilitate business relationships. B2B companies are facing multiple challenges where technology could help. As offering portfolios grow in complexity, B2B customers can benefit from increased transparency to their account information. Additionally, visibility over offering catalogs enables them to more easily select the right products and services. Moreover, customers expect their providers to share insights from the ever-expanding amount of asset or service data. Despite evolving buying behaviours and a variety of available technologies to support digital initiatives, companies have not fully embraced existing digital solutions in B2C to enhance customer experience. The three main reasons why digital customer experience is not leveraged optimally in B2B are differences in buying behaviour, characteristic of transactions, and technology (figure 1). The first reason is B2B buying behaviour: transactions are more complex and human relationships run deeper than in B2C. B2B transactions generally involve more money and risk, and procurement processes are more complex, creating a need for human interaction. 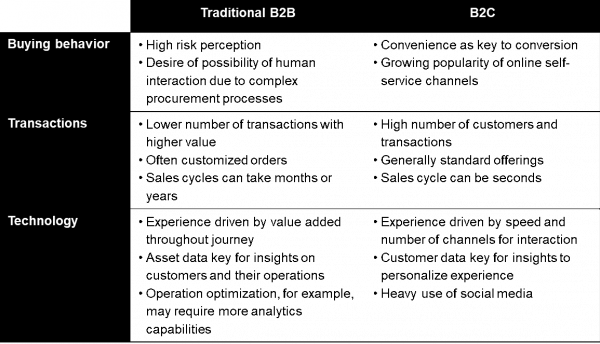 B2B offerings are also often customized, whereas a higher level of standardization is the norm in B2C. However, while seeking convenience and speed of transactions, newer generations of B2B buyers are evolving and prefer self-service channels to purchase. The tendency is especially visible for reorders and puts pressure on suppliers to digitize such touch points. In the past, the lower volume of transactions in B2B have delayed adoption of digital tools in customer experience management. B2C firms usually have a significantly higher number of customers and transactions than in B2B, for whom transaction costs are also higher. The high investments required to implement new digital solutions often outweighed the benefits of digitally streamlined processes. With more standardized solutions available and technology costs declining, implementing digital tools for customer experience is more accessible in B2B. For instance, IoT sensors, cloud solutions, and analytics capabilities have evolved significantly and allow providers to leverage data to generate insights about assets, customers and end-users. Technologically, B2B companies are now better equipped to design coherent and personalized customer experiences. Historically, customer experience leaders have outperformed market benchmarks and laggards on the stock market (figure 2). Leaders have generated 108% 8-year stock market return, while the S&P 500 earned 72%. Laggards have generated only 28% returns, highlighting the importance of customer experience for shareholder value. Various analysts estimate that B2B eCommerce in the US alone will reach 1,2TUSD, or 13% of B2B sales, in 2021. Worldwide, it could reach almost 7TUSD by 2020. In comparison, B2B eCommerce estimations in US for 2017 are around 900BUSD, raising the expectations of an annual growth above 7% for the coming years. The potential for B2B eCommerce, the increasing importance of customer experience, and the low maturity in B2B digital customer experience combine to offer a window of opportunity for B2B firms. The interviewed companies are investing in virtual or augmented reality, robotics, process automation and integrated (pre-) sales tools to enhance customer experience. However, a customer portal is identified as a simple and proven tool in B2C that can provide value throughout the whole customer journey. Grainger, a provider of industrial tools and supplies, provides extensive functionalities to search and explore its offering catalog in its customer portal to increase transparency and facilitate purchasing. Companies also can provide order management functionalities through portals. Red Bull, for instance, globally launched an order management platform for their B2B customers in 2013. Digital customer portals are secure and private platforms providing account specific information, such as purchased offerings and real-time operations data, can enable self-service transactions online. The basic use cases for customer portals do not require high complexity, nor heavy investments. This accessibility makes them effective tools to develop digital customer experience management (CEM) capabilities. B2C industries have leveraged customer portals, either web-based or through mobile apps, for many years. E-commerce and online banking services use them to enhance convenience, simplify the customer interface, and personalize customer service. The scope of the portals can be expanded over time based on needs (figure 3). Digital portals can be built iteratively, where new developments incrementally complement existing services, providing additional value in an agile fashion. At first, customer portals can be reporting tools providing customers a functional, real-time dashboard and account summary. Furthermore, analytics can generate more value, providing customers recommendations and alerts to improve their operations. Gradually, portals can be developed to enable transactions, facilitating customers’ purchasing process. In the future, customer portals and analytics tools will also enable new business models. In their simplest use, digital customer portals can be used to report service or asset status. They can also provide additional communication channels to the customers, such as chat. Transaction history and on-going services can be summarized and available anytime. In industrial settings, machines can transmit data regarding the state of their parts. In service industries, schedules and on-going projects progress can be communicated through portals. For customers, the knowledge of the equipment usage or consumed supplies can strengthen their planning process. Data sharing through portals enables more efficient operations management and decreases the transaction costs to access data. Companies also use portals to allow customers to browse their offering catalog to increase awareness and transparency. B2B providers also observe benefits of reporting through a portal. Take the example of a global industrial service firm located in the Nordics. The company provides information about the service status of their customers’ assets through its portal. Customers can verify when maintenance should take place, if maintenance is scheduled, the date, technician name, and contact information. After implementing the functionality, the company observed a 30-40% decrease of calls to its support service center. The portal has enabled the firm to both decrease costs and communicate more efficiently with customers. Interviewees highlighted the growing desire among customers to be provided insights at different stages of the journey to improve asset management. Integrating analytics, preventive and prescriptive, to data adds value and supports building additional revenue streams. On one hand, portals can enable smart, preventive maintenance for assets, decreasing downtime of operations. On the other, customers can benefit from add-on services, providing them additional insights on how to achieve a higher yield in production or to optimize their supply chain. Data and insight services can also be monetized and delivered “as-a-Service”. Successful companies grow consultancy revenues by leveraging their expertise to identify the key data points and value drivers for their customers, and share related data and insights. A global original equipment manufacturer (OEM) has addressed this opportunity. To improve the experience, the company shares gathered data and provides status alerts. Based on the information, customers can improve their processes or asset usage, and resolve problems faster to limit downtime. An additional benefit is the facilitation of sales for preventive maintenance, as equipment status is transparent to customers. Operational insights increased service revenues with consulting customers, for example, to improve yield or decrease waste. As analytics and artificial intelligence capabilities are bound to keep improving, the value of such services will only continue to increase in the future. Adapting to the shift in customer buying behaviour, a comprehensive digital portal can become a self-service tool to help providers capitalize on recommendations. Digital portals can enable customers to purchase products or services easily. The sales cycles become faster and more convenient for buyers. Options for configuration can also be available, decreasing the need for human interaction. For B2B companies, cost of sales decreases, while chances for mistakes also fall due to process automation. A Nordic waste management company implemented a similar solution, enabling customers to order additional containers with a few clicks, decreasing the time away from their own operations. Customer portals and their uses are bound to develop further in the future, enabling new business models and service offerings, such as outcome-based contracts. For example, a maintenance worker could be automatically dispatched on premise to maintain assets after an alert is triggered, without any direct human interaction, to ensure continuous production. Several additional use cases are yet to be developed for portals. However, digital portals can be developed incrementally at the desired pace, to maintain investments within budget, leveraging service design methodologies. To ensure the development of the right digital touch points supporting the customer journey, B2B firms should discuss with their customers to identify the interactions that are most important and the digital touchpoints that are value adding. Mapping the customer journeys and understanding customer needs and expectations is essential to ensure the right touch points are digitized. Through this process, interactions with most impact are prioritized, ensuring an efficient use of the development budget. A large Nordic IT company devotes an unit for customer experience management. The company developed an internal program to raise awareness on how customer satisfaction can be improved by each role. The firm also mapped the different personas, or roles, within their customers to identify their specific needs across their journeys. Once the touch points to be digitized are identified, a key success factor is to involve the customer early on in design and development. The same Nordic IT provider promotes co-innovation with its customers, ensuring products that fulfill customer needs and avoiding costs related to re-building or modifying a completed tool. Several companies interviewed also host workshops with their customers to pinpoint the existing challenges, and the optimal solutions. Companies regularly test the prototypes with users throughout the development to ensure focus on the right scope and functionalities. An enriching customer experience is the result of the combination between human and digital interactions. To successfully develop digital tools such as customer portals, human interaction is required, and customer-centric firms achieve better results. Such interactions enable stronger customer relationships and trust. Operating in a customer-focused way is an organizational choice: it should be driven by the firm’s management and cascaded down through all the ranks to ensure that frontline employees understand how their role creates value for the customers. To initiate the development of customer portals, or any other digital tools, firms can start by mapping most critical customer journeys and then develop a simple customer portal that could be enhanced over time. For B2B companies, customer experience management is a double-edged sword that can be rewarding if initiatives are undertaken across the organization. Oppositely, companies may not reach their ambitions with partial implementation, or if either human or digital aspect is left underdeveloped.